Heard about digestive bitters and wonder if they could help you with digestive discomfort? Can kids use them? What are they, anyway? Can you make them yourself and save money? 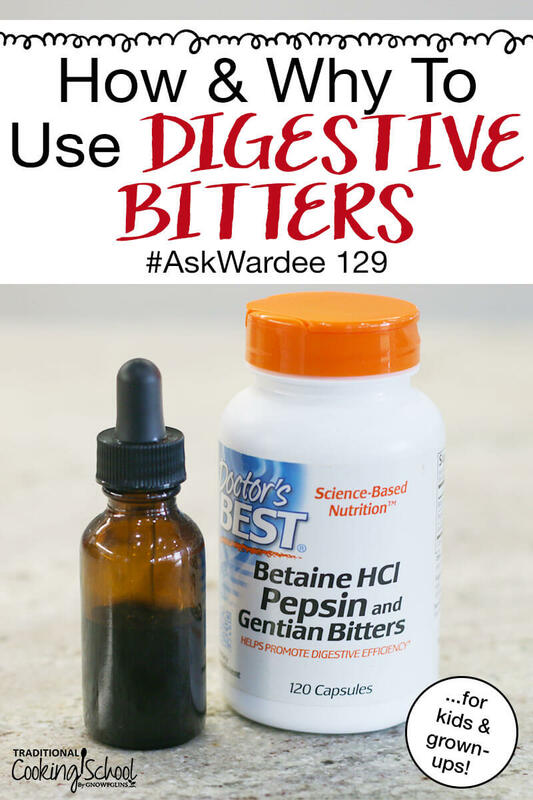 Some of these questions came in from Rachel M. and I'm thrilled to tackle the topic of digestive bitters on today's #AskWardee. The Question: What Are Digestive Bitters, How Do They Help, And Who Can Use Them? Can Children Take Digestive Bitters? What About The Bitter Taste? Hello! I had a question about digestive bitters. I have heard about them and even read about them a little bit, but are you able to condense in an understandable way exactly what they are and how they are helpful? Also, where do you get good quality bitters and how often do you suggest taking them? What about giving them to children? Thank you! Rachel, thank you for your question! Put simply, digestive bitters are food compounds such as herbs, roots, fruit, bark, and greens that improve your digestion by stimulating your digestive system and production of digestive enzymes. And, they improve the function of your digestive organs such as your liver, and promote overall good health. Although they can be eaten directly (such as bitter greens in salad), they are most often concentrated into infusions or tinctures and consumed that way. And yes, they often have a bitter, sour, or bittersweet flavor! As Andrea, TCS writer, shared in 3 Easy Ways To Use Digestive Bitters, you can eat bitter greens such as chicory, radicchio, dandelion, and arugula. An infusion is where you steep a higher concentration of herbs (compared to tea) in hot water and for longer than you would tea. Ideally, you're preparing it the day or evening before, then straining and sipping on it with your meals. A tincture is where you cover the herbs with alcohol or glycerin to draw out their properties. An alcohol tincture takes 6 weeks in a dark, cool cupboard. An alcohol-free glycerin based tincture takes 3 days in a warm environment such as a crockpot. Click here for instructions on making homemade infusions and tinctures. Click here for directions on making alcohol-free tinctures. Anyone who experiences regular tummy aches or heartburn from eating, either immediately or hours later, can benefit from digestive bitters! Anyone who feels their digestion is sluggish and could use a boost can benefit from digestive bitters. Although you should consult with your doctor and do your own research, it is generally known that children over the age of 2 may use digestive bitters. Always reduce the recommended serving size down proportionately with the child's size. For instance, most serving sizes are for an adult weighing 150 pounds. So a child weighing 75 pounds would get half the amount. And so on. You can incorporate bitter greens such as chicory, radicchio, dandelion, and arugula in your salads. While I don't enjoy an entire salad of bitter greens, I do enjoy these greens when balanced with other flavors that are mild, sweet, or sour. If you feel you need more help than what raw greens provide, infusions and tinctures can provide more concentrated digestive help. Sip on a bitter infusion before, during, and after a meal. Or dilute a dropperful of a tincture in 1 ounce of water and drink before, during, or after your meal. Finally, another option is to take capsules such as the one pictured above. It contains HCl to balance stomach acid levels, pepsin to help with protein breakdown, and gentian to stimulate and support digestion as I shared previously. You can save a bundle if you make your own infusions and/or tinctures! 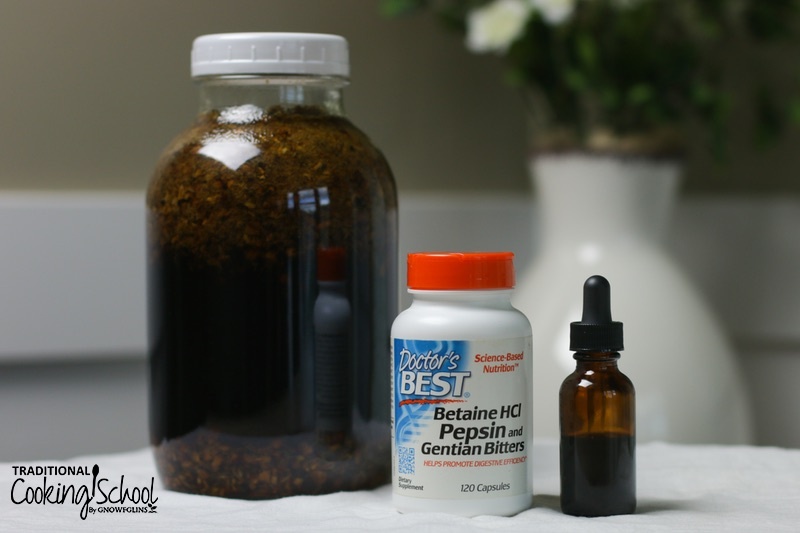 This list is copied from 3 Ways To Use Digestive Bitters. Use singles or a blend when making your own tinctures and infusions! Artichoke stimulates the liver, may lower cholesterol, and is an antioxidant (source). Black walnut cleanses and tones the colon, and helps prevent leaky bowel syndrome (source). Burdock stimulates digestive juices (especially bile) and improves appetite (source). Centaury strengthens the stomach, promotes digestion, and helps with diarrhea (source). Chamomile relaxes, relieves indigestion and inflammation, and eases flatulence (source). Dandelion is a diuretic and especially benefits the liver and gall bladder (source). Fennel relieves flatulence and stimulates digestion and appetite (source). White horehound stimulates the gallbladder (source). Wormwood stimulates the digestive process and helps indigestion (source). Yarrow increases appetite, aids digestive cramps, bloating, and colic, and normalizes blood circulation (source). Yellow dock promotes flow of bile and eases constipation (source). If you want to buy pre-made bitter tinctures, try these from Herb Pharm. To make your own infusions and/or tinctures, we recommend Frontier and Starwest Bontanicals. Although it's true that for many, the bitter taste will take some adjustment, when making your own infusions or tinctures, you can add balancing and complementary ingredients such as cardamom, cinnamon, clove, or ginger. They will help it taste better! More info on this here. 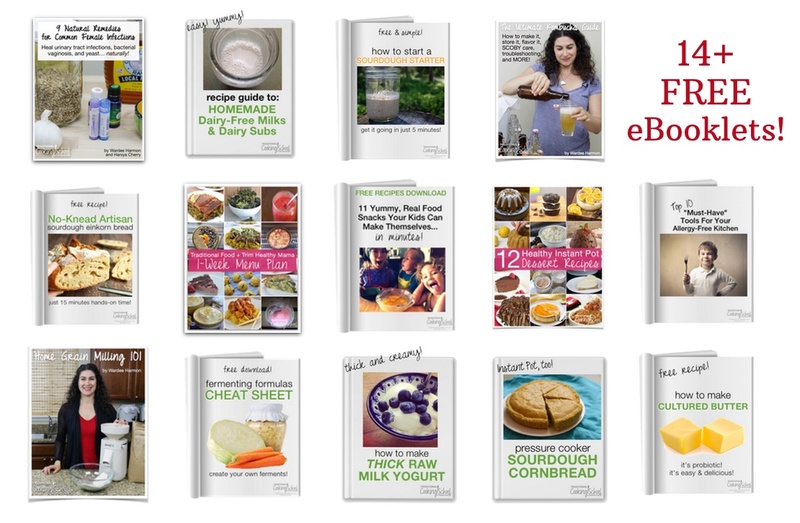 If you haven't already, be sure to sign up for the FREE Traditional Cooking Cupboard… you'll get 14+ FREE eBooks featuring recipes, info, and articles on Traditional Cooking School, and a free Traditional Cooking video series! Click here to grab your 14+ free eBooks and free video series today! If you have other questions or comments about your own experience with fermentation and alcohol production, be sure to leave them in the comments! Go to Traditional Cooking School on Facebook to view the Facebook Live replay or go to @TradCookSchool on Instagram on your phone or tablet (Instagram recording only lasts 24 hours). Do you use digestive bitters? What is your favorite form — greens, infusions, tinctures, capsules or ??? Wardee, I know you aren’t a doctor, but I’m hoping some of your readers might be in the appropriate medical field. So…many herbs work to improve the health of the gallbladder — I have no gallbladder, it was removed in 1994. Therefore, my bile production is reduced. I have difficulty if my food contains too much oil or fat. What food and/or herbal combinations can help me better digest what I eat so I don’t have to worry about being close to a bathroom all the time? Hopefully someone can help.